The Lower Yuba River is a tributary of the Feather River that flows below Englebright Lake downstream through Marysville where it meets the Feather. 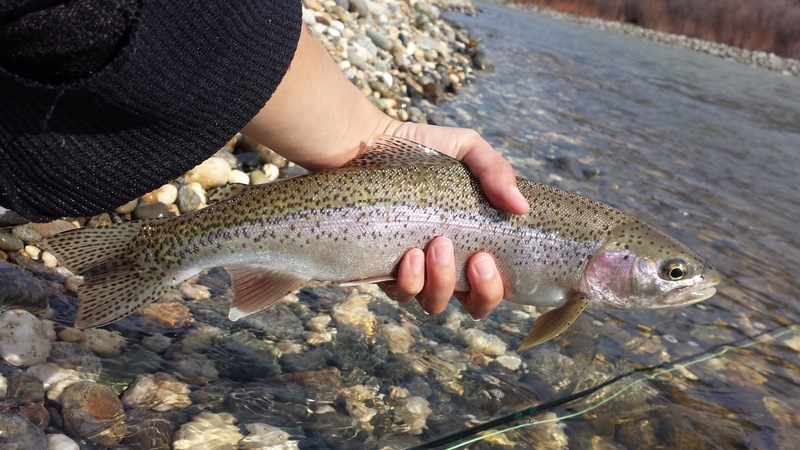 The Lower Yuba is a tailwater fishery that is notorious for its elusive rainbow trout that fight like steelhead. 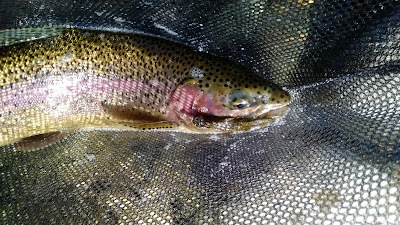 All of the fish in the Lower Yuba are wild with the exception of a few Feather River hatchery steelhead that will occasionally make their way up the river. This river is often considered to be a very technical and challenging fishery. 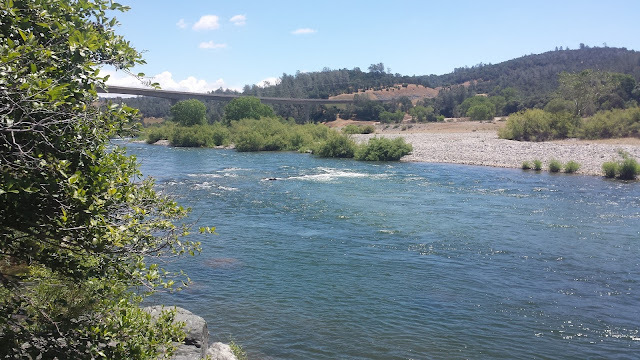 Unlike many other rivers, the Lower Yuba contains very few "tells" of where the fish are holding. The river is mostly made up of gravel and cobblestone due to decades of mining therefore there aren't very many key structures to look for such as overhanging trees or big boulders. Knowing how to read water well is critical. In addition to water that is hard to read, the fish in the Yuba also like to vary their diet and will key in on specific insects and their stages. Knowledge of the diverse insect population living underneath the water's surface is necessary in order to be successful on the Lower Yuba. 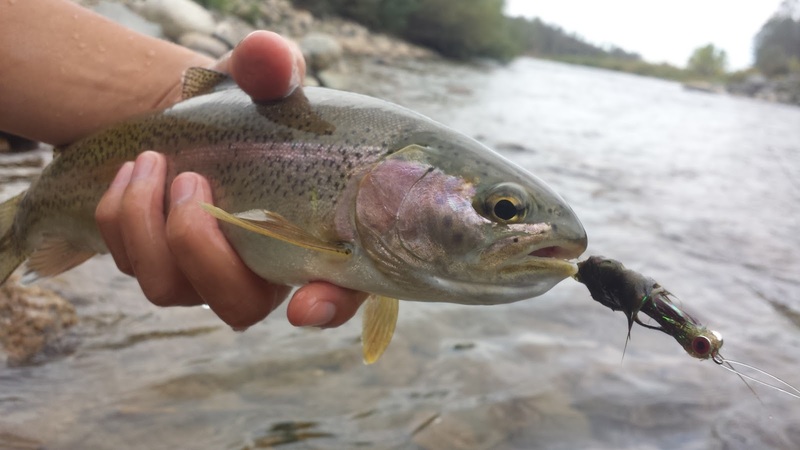 The Yuba is my home river and this is how I fish it. A) From mouth to Highway 20 bridge. B) From Highway 20 bridge to Englebright Dam. 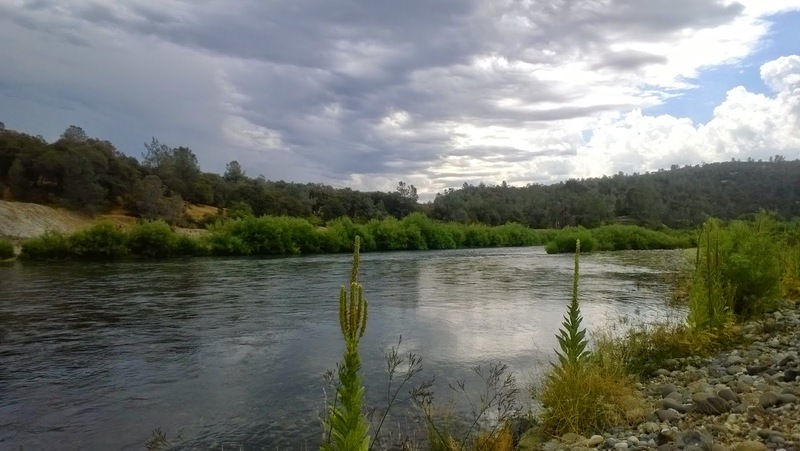 The Lower Yuba is changing constantly. The gravel and cobblestone that make up the river is easily push around by extreme heavy flows and will often leave you with a new river to explore once it comes to shape. This is one unique traits of the Lower Yuba. Parks Bar Road is the furthest public access upstream that will allow you to access the Lower Yuba above HWY 20 bridge for about half a mile and a few yards downstream of the bridge. Park in the cul-de-sac or along the clay wall. To access the Lower Yuba below HWY 20 bridge take Old Bonanza Ranch Road and then take Hammonton Road. Hammonton Road follows the Yuba River for about 2.5 miles and will allow you to access some of the best water on the river. This road is not maintained by the county therefore be cautious of potholes, bumps, and sharp dips. A 4-wheel drive high clearance vehicle is recommended but a 2-wheel drive sedan will manage just fine. Hammon Grove Park is a public access off HWY 20. The park is well-maintained, free, and is open one hour before sunset and one hour after sunset. From here you can hike downstream to Sycamore Ranch or upstream to your hearts content. Make sure you stay in the high water mark to avoiding trespassing on private property. Sycamore Ranch is the last public access off HWY 20 before Daguerre Dam. The park is also well-maintained, free, and is open one hour before sunset and one hour after sunset. You can also camp here during the summer season. This is where many floating anglers take out. 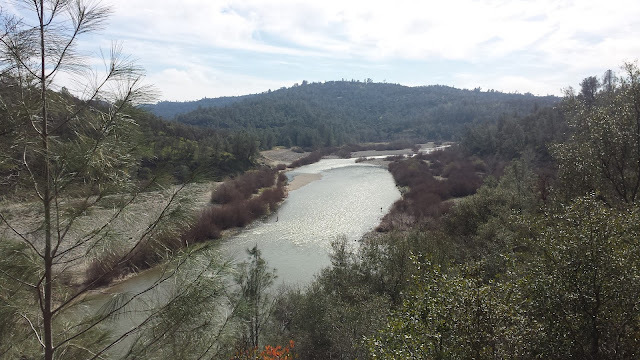 Hallwood Boulevard is the only public access to Lower Yuba below Daguerre Dam. This access is usually the busiest during the shad season. Park along the road and hike down to the river. Below Daguerre Dam you can find American shad and striped bass. Both species are unable to migrate above the dam and will hold there from spring to as long as early fall. In the early spring the fish will be keying primarily on BWOs but will also take midges and PMDs. The famous skwala hatch is also during this time and can start as early as December to as late as April. 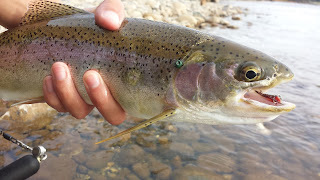 If the water is off-colored a few flies that have been proven to work are egg and worm patterns. In the middle of spring the fish tend to switch diets a bit but the key hatches during this time of year will be March browns and PMDs. Once the water has warmed up a bit the caddis will start becoming more active. Evenings will bring about a good last light caddis hatch which can be an excellent time to swing emergers or try dries. The late spring is when the American shad arrive to the Lower Yuba River. Both American shad and striped bass can be found throughout the river below Daguerre Dam. The Lower Yuba tends to be a bit finicky during the summer as the spring hatches begin to fade off. The evening caddis hatch reaches its peak in the early summer but will continue until fall. I've found PMD patterns to be the most productive nymph throughout the summer. 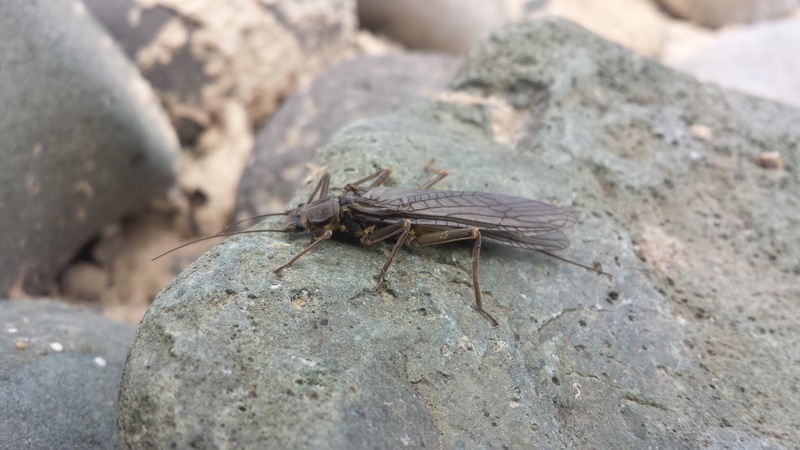 In May and June the fish will start keying in on golden stoneflies. Nymphing with a rubberleg stone or throwing a big dry can produce some nice fish. Hoppers are also on the menu during the summer and will often coincide with the golden stone hatch giving you a better chance at rising a fish. 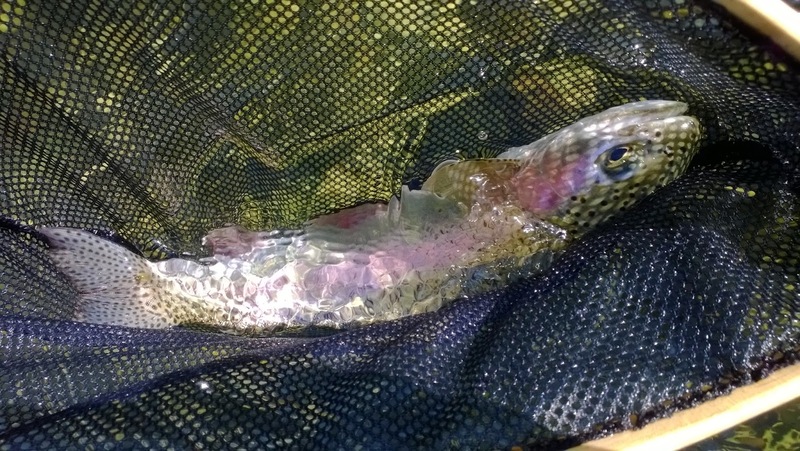 My favorite method to fish the Lower Yuba in the summer is by stripping streamers. 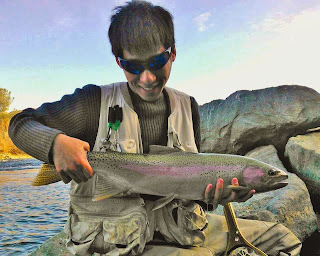 The water is warm enough for them to chase and what's better than watching a Yuba rainbow smash a big streamer? The American shad tend to stay in the Lower Yuba for a longer period of time in comparison to other rivers due to the colder water temperatures. They can be caught from May through July below Daguerre Dam. At the end of summer the short-wing stoneflies will begin hatching. The shucks of the nymphs will litter the banks and the adults will be hiding underneath rocks. You can use a #4 dark brown Chubby Chernobyl to imitate a female depositing her eggs. The fishing tends to pick back up in the fall as the water begins to cool down. The flows are also lowered for the rest of the year which makes the river easier to wade. 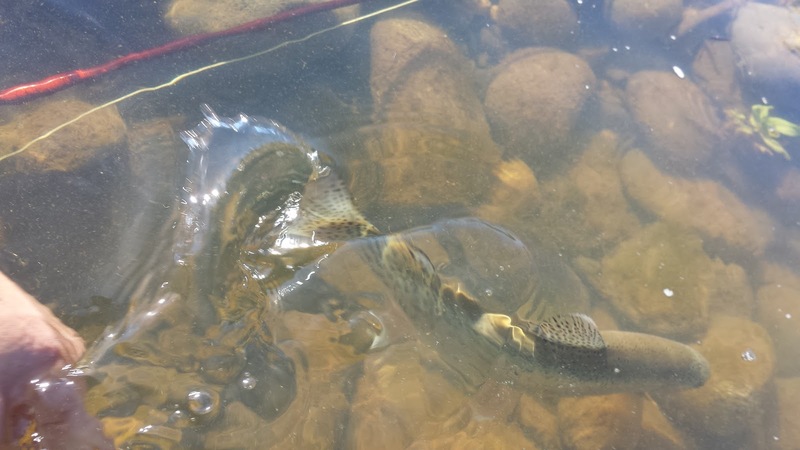 The egg bite is the main attraction that draws the attention of anglers in the fall. The salmon will usually show up in September and will linger around to as late as December. Both the local rainbows and steelhead will hold around the salmon and feed on insects that are dislodged during redd cutting and eggs that are dropped during the spawn. Be mindful of where you step because the redds are difficult to spot on the Lower Yuba. Watch out for redds above riffles. The late fall will bring back the BWO hatch which happens both in the morning and at noon. Overcast days will produce the best hatches. The winter is when the Lower Yuba fishes at it's best. 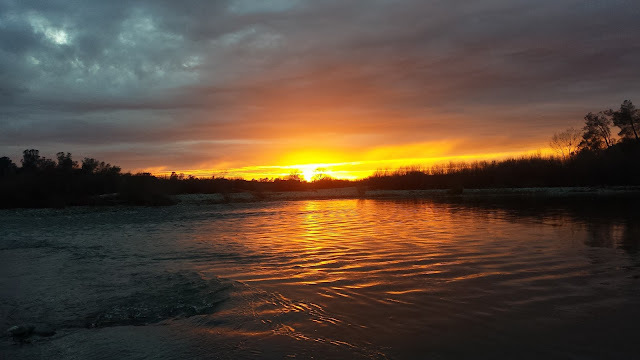 Although rainfall can limit the number of fishable days on the Lower Yuba, the fishing can be fantastic when the flows are stable. The Lower Yuba can be a great winter dry fly fishery as the fish key in on emerging BWOs, PMDs, and possibly skwalas. Watch the flats, foam lines, and tail-outs in the morning and afternoon for risers. Nymphing the patterns of these winter insects along with midge, egg, and worm patterns can also be productive throughout the winter especially when the water is tinted. This is the best time of year to catch big winter steelhead and fat Yuba natives. The fish in the Lower Yuba tend to hold close to the bank in seams, breaks, and under the willows. Makes you focus more on these holding areas as you carefully work your way downstream covering water. Allows for better control of your drift and depth by raising or lowering your rod. Focuses more on what you feel rather than what you see. This results in a quicker and better hook set. You tend to be sneakier when tight-lining because your are limited to the length of your rod. Indicators are useful when fishing the slower and deeper runs of the Lower Yuba. Adjust your indicator from time to time to make sure you are about 1ft from the bottom. Adding or subtracting splitshots and tippet can be helpful during high water or gin clear conditions. There may be times when you will need to rig three nymphs in order to figure out what the fish are eating. Be careful casting three fly rigs because they can get tangled very easily. Once I find two flies that work I will rig those two up and put away the one that isn't working. Dry fly fishing the Lower Yuba is spring-creek levels of challenging. Bring your A-game because catching a Yuba bow on a dry requires near perfect presentation. You absolutely must have the correct stage of the insect tied on. If you see just the top of the fish break the surface that usually indicates that they are eating something just below the surface. If you see bubbles after the fish rises that means that they are eating something above the surface. The louder the rise the bigger the fish. If the fish see your tippet before your fly they will not take it. Use a reach cast or cast over your opposite shoulder to show your dry before your tippet. Carry different sizes of tippet in case you need to extend or lower your tippet. Remember that fish are stupid but they aren't blind. Change your presentation until you find what works. The flats, foam lines, and tail-outs are the most productive places to catch the hatch. A hopper-dropper combo can work well when the fish are keyed in on dries. Swinging a fly across the river also works well on Lower Yuba. Nothing beats a tight swung grab from a strong Yuba bow. You may not catch a lot of fish using this method but it's one of the most adrenaline pumping ways to fly fish. When the water is high over 1,000+ CFS I like to swing a streamer tied with a non-slip loop knot with a 10ft 6ips versileader and about 4ft of 10# mono leader. When the water is low under 1,000 CFS I will add about 4ft of tippet to my 9ft tapered leader and tie on a nymph and a dropper. Swinging an egg pattern with a dropper during the egg bite season is one of my favorite ways to fish the Lower Yuba in the fall. I've found swinging right below or behind salmon to be the most productive method. Riffles and runs tend to be the most productive areas to swing flies. Stripping streamers during the warm summer months is both productive and fun when nymphing and dry fly fishing is slow. My set-up for this rig is the same as my swinging set-up, a streamer tied with a non-slip loop knot with a 10ft 6ips versileader and about 4ft of 10# mono leader. Keep your retrieve fast and steady. The strike will usually happen as your streamer begins to swing across the current. Don't set the hook if you feel a strike, instead wait for the fish to hook itself. Stripping streamers works best in the late spring, summer, and early fall when the water is warm. Cast your streamer in the Lower Yuba's deeper runs, pools, and riffles and try to cover as much water as you can. Here are more tips for stripping streamers. During heavy rainfall events the Lower Yuba can rise quite a bit. Usually any flow over 3,000 CFS is considered blown out. When it comes to river clarity the rule of thumb is that if Deer Creek is over 500 CFS the river will be brown and the visibility will be low. I personally don't find low clarity as much as a problem as high flows. The most important tip I can give you is location, location, location. The fish in Lower Yuba like to move around a lot so don't spend too much time in one spot. Change flies a few times, try again, and then move on. I've run into a lot of anglers who have told me they were catching a bunch of fish in this section yesterday only to come back the following day and not catch anything. Don't overlook the nooks and crannies. Cover water and find the fish. Excellent Matthew, thanks for the props. I think it's time you start submitting articles to California Fly Fisher. I can help steer you in the right direction if you're interested, just shoot me an email. Thanks Jon! I'll hit you up soon! Glad you liked it Mike. Like many other I love this river! Wow, thank you for such an in-depth article!